Globally, they’re down about 8 pct. Local pain explains Lloyds and Bank of Ireland. Sovereign debt exposure is a problem for Intesa Sanpaolo and others. Santander has a Spanish election to worry about. The likes of BofA and SocGen, though, seem swept up in a sea of confusion. 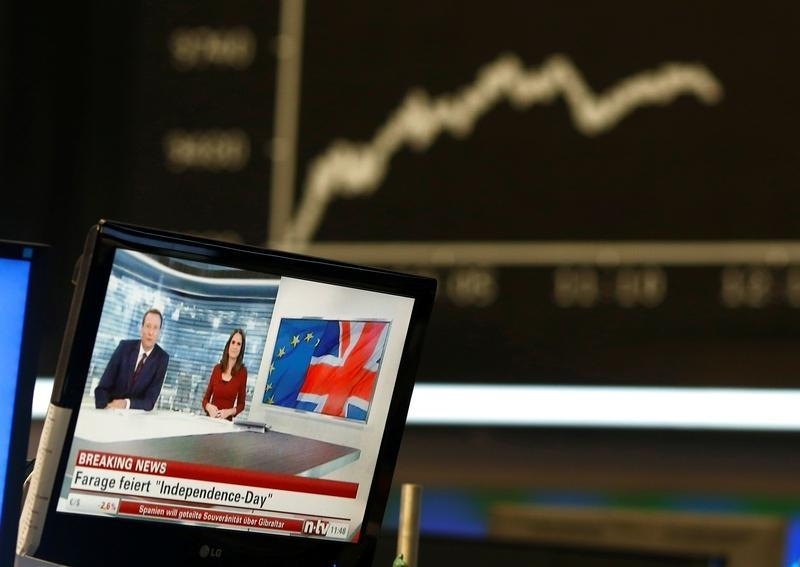 A news broadcast on a TV is pictured in front of the German share price index DAX board, at the stock exchange in Frankfurt, Germany, June 24, 2016. Global bank shares fell sharply in trading on June 24 following the UK’s referendum vote to leave the European Union. At 1545 BST the MSCI International World Banks Realtime Index was down 7.5 percent. In the euro zone, the biggest fallers included Bank of Ireland, down 23 percent, Italy’s UniCredit, which was off 21 percent, Spain’s Banco Sabadell, which had dropped 20 percent and France’s Société Générale, which slumped 19.5 percent. Among American banks, Morgan Stanley had fallen 8.6 percent, Citigroup was down 7 percent, and Bank of America was off 5.5 percent.